You are here: Home » Christmas Time??? Yeah, I know it is not Christmas season, but other than using both red and green sauces, this dish doesn’t really evoke the Christmas feeling for me. It was good, just not Christmassy! This was quite a collection of flavors that all worked. Quite a few ingredients here. 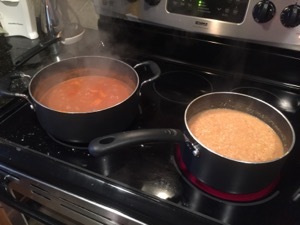 You really end up making two sauces so be prepared for double the work and double the posts and pans to wash. 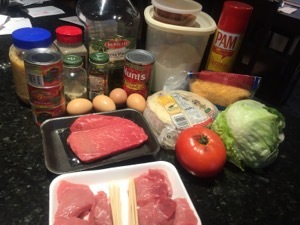 The red sauce is in process. Like many green sauces, this was a really pale green. Load them up with the Yin/Yang of enchilada sauces. 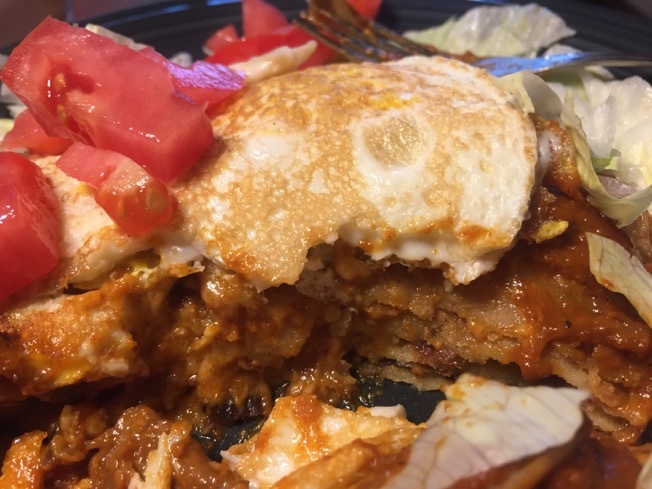 So it got a little messy….the cook doesn’t clean, right? Make the green sauce: Heat the olive oil in a large saucepan over medium-high heat. Season the pork with garlic salt and pepper, add to the pan and brown on all sides. Add the minced garlic and cook 30 seconds, then add the chiles, tomatoes, red pepper flakes and 3 cups water. 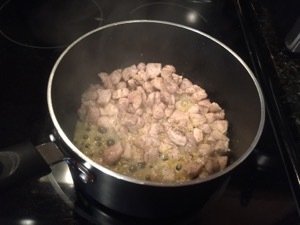 Simmer until the pork is tender, about 1 hour. Combine the flour and 1 cup water in a blender until smooth, then whisk into the sauce and simmer until the sauce thickens, about 5 more minutes. 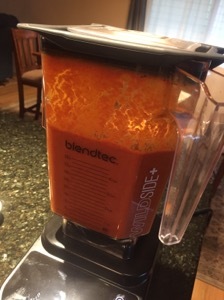 Meanwhile, make the red sauce: Process the chili powder, garlic and 5 cups water in a blender until smooth. Season the flour with garlic salt and pepper in a shallow dish. Heat the olive oil in a large skillet over medium-high heat. 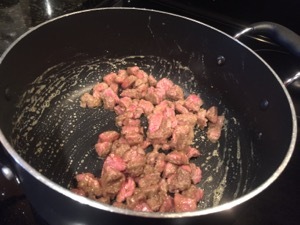 Toss the beef in the flour, then add to the skillet to brown on all sides. 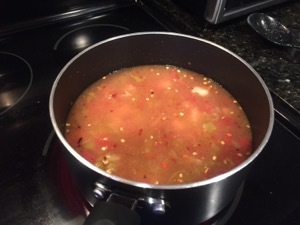 Pour in the chili powder mixture and simmer until the beef is tender, about 15 minutes. 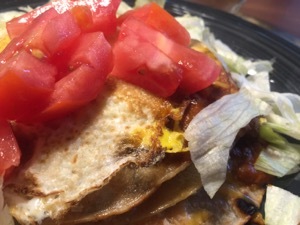 Make the enchiladas: Preheat the broiler. 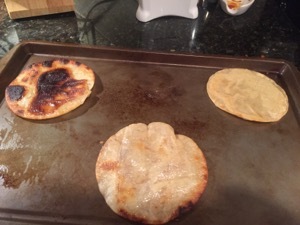 Place 4 tortillas on a baking sheet. 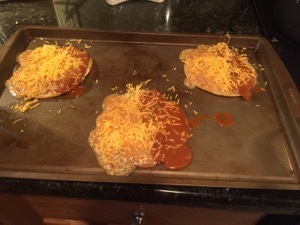 Sprinkle each with cheese, then top with green sauce on one side and red on the other. Repeat to make two more layers. 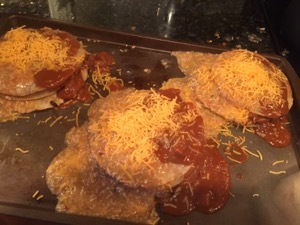 Top the stacks with more cheese and broil until melted, 3 to 5 minutes. Meanwhile, mist a nonstick skillet with cooking spray and fry the eggs as desired, then season with salt and pepper. 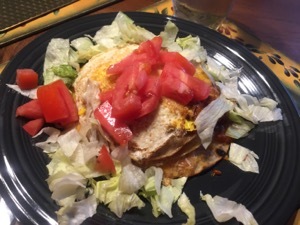 Top each enchilada stack with lettuce, tomatoes and a fried egg.